Learn the 2 apps that allow you to view the content of a QIF file on your Android device. Most bank and credit card sites allow you to download your financial/credit card statements in QIF file format for viewing or importing them into your financial software. In the event related to that, I downloaded my March credit card statement in QIF format a couple of days ago, and wondered how to view it on my Android device. I tried getting the Quicken app from PlayStore. Unfortunately, I wasn’t allowed to download it as it isn’t compatible with any of my Android devices. Using a text editor app such as Jota Text Editor, you can open a QIF file and view its content unformatted. There is a huge selection of personal finance apps on Google Play, and some of them allow you to import transactions from QIF files – My Expense is surely one of them. 1. 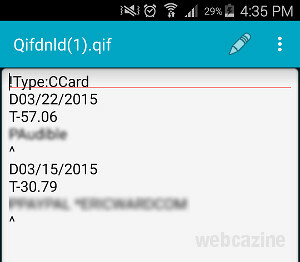 Download My Expense from the Google Play store. 2. 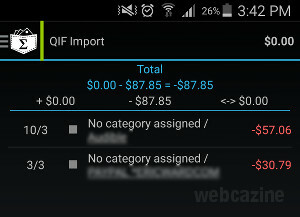 On the My Expense’s Settings, tap QIF import. 3. 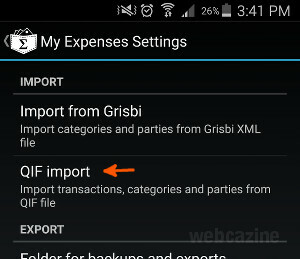 Select the QIF file you want to import, and then tap OK.
4. When the import finishes, you can view the transactions in My Expense. 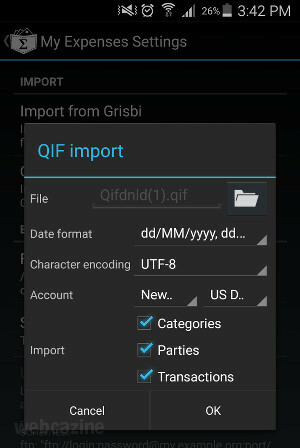 If you know of any other apps that let you view the QIF files on your Android device, share them in the comments.